Positives: From his return to the big on May 15 through the end of August, Flaherty went 8-5 with a 2.80 ERA and a .185 BAA….had two different 13 strikeout games….took a no-hitter into the seventh against the Brewers before it was broken up by a Jesus Aguliar home run….limited lefties to a .194 average….had a 2.93 ERA in home games….batters hit just .186 against him in the second half….went 4-0 with a 1.13 ERA in August….had a 1.24 ERA in his eight wins….had a 2.82 ERA in games where he got two or fewer runs of support….batters had a .594 OPS when they swung at the first pitch….only six times in 28 games did the leadoff batter of the game reach….allowed just one home run with runners in scoring position….batters hit .169 in high-leverage situations….had a .571 OPS against the first time through the lineup….posted a 1.93 ERA and a .173 BAA against the Brewers while winning all four of his games against them. Negatives: Probably due to workload issues, slumped in September and posted a 5.34 ERA in six starts, none of which he won….was forced to spend a few weeks in Memphis at the beginning of the year while Adam Wainwright was healthy….his strikeout to walk ratio against lefties was 2.13, over 2.5 less than what it was against righties….had a 3.67 ERA on the road….gave up four home runs in September….allowed a .855 OPS when batters were ahead in the count….nine of the 20 homers he allowed came in the first 25 pitches of the game….walked ten in 12.2 innings against the Cubs. 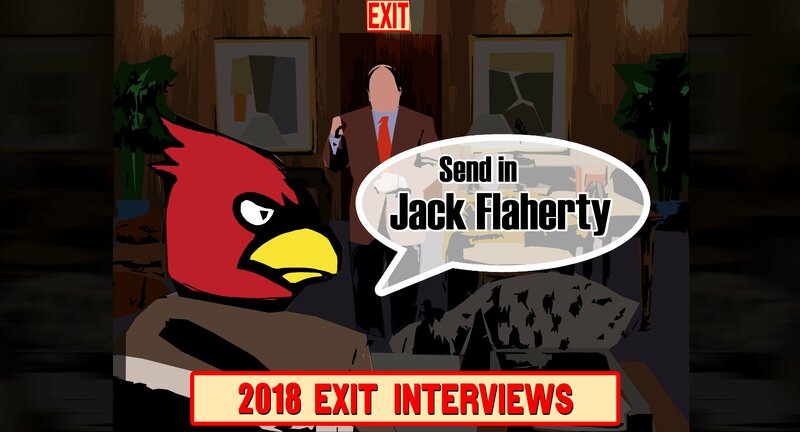 Overview: After seeing the results for Flaherty at the end of 2017, I worried that the hype was a little overstated. Instead, Flaherty came out and showed what everyone was talking about, dominating most opposition and becoming the second-most reliable starter after Miles Mikolas. Flaherty’s September swoon possibly cost him from being a Rookie of the Year finalist (though there were a number of good choices this season) but did nothing to dim his star going forward. I think many people expected Flaherty to be good this year but I’m not sure everyone expected the level of excellence that he sustained. Outlook: Flaherty only recorded an out in the seventh inning five times this season, so figuring out a way to go deeper into games is a big deal for him, especially given how volitile bullpens can be. That said, Flaherty has claimed the “next man up” spot when it comes to Cardinal aces. While Carlos Martinez will still have that crown for right now and Alex Reyes may have something to say about it if he can return and be at the level we all have expected, Flaherty is right there in the mix and will be a huge asset for the Cardinals for years to come.